The size of your email database and the relationship you have with them will, over time, become the most valuable aspect of your online business. Once you have an email database, of people who trust you, you can send out a special offer and just about be guaranteed of making money. And you can do this time and again over the months and years ahead. It’s important to remember, your email database is not just a collection of names without faces. Each email address represents an individual, who has given you permission to con­tact them. This allows you to build a one-to-one relationship with each person. This relationship should never be compromised or exploited. Otherwise you will lose peo­ple’s trust and they can easily unsubscribe from your list. Let me share with you a rather startling statistic. Direct marketers have known for years that it takes an average of seven follow-up messages with a new prospect before that per­son makes a purchase and becomes a customer. Think about that carefully. An average of seven follow up messages. Then, consider how many contacts the average website makes with its visitors. That’s right. In most cases, if someone doesn’t buy from a website on the first visit, it’s un­likely they’ll come back. They’ve gone for good. So, the average website owner is falling short of the mark by a whopping six follow-up contacts. It usually takes time on the Internet to build up a relationship with your prospective cus­tomer to the point where they are willing to buy from you. Unless you are selling a cheap product, which people don’t have to think about, you will probably need to make several contacts with your prospect before they are ready to purchase. The need for email follow up is particularly important if you are spending money on Google Ads or other paid advertising to get traffic to your website. For the sake of illustration, let’s say you are spending $1000 a month on Google Ads. And again for the sake of illustration, let’s say you are getting 10,000 visitors a month to your website as a result of this advertising. A typical conversion rate for pay per click advertising is 2%. So this would mean you make 200 sales per month as a result of your advertising. You may be quite happy with that return on your investment. But consider this. What happens to the other 9800 visitors who came to your website but didn’t buy? Perhaps they were genuine prospects for your products or services but they were not quite ready at the time they visited your site. If you’re like most website owners, who never follow up their visitors, those 9800 people are gone forever. Let’s say you offer a free email newsletter on your website and make it sound attractive enough for people to subscribe. It’s quite feasible you would get 10% of your visitors sign­ing up for this newsletter. Using the same figures from the previous example, you would get 1000 subscribers per month to your newsletter, or 12,000 subscribers per year! Image that, you could build an email database of 12,000 targeted prospects within 12 months. And it wouldn’t cost you anything extra! Now, instead of those visitors simply disappearing into thin air, you will have 1000 new prospects to follow up each month. And that figure is conservative. It’s quite possible you could get 20% of your visitors signing up to your newsletter, resulting in 2000 new sub­scribers a month. Do you think a few of these subscribers might eventually become your customers if you follow them up courteously and consistently? Of course they will! Think about it, the very fact they visited your website in the first place, shows they have some interest in what you are selling. And the fact they signed up for your newsletter makes them even more targeted prospects. Now, every month (or more often) as your email your newsletter, you’ll develop a deeper re­lationship with them. They’ll appreciate your expertise and trust you further. 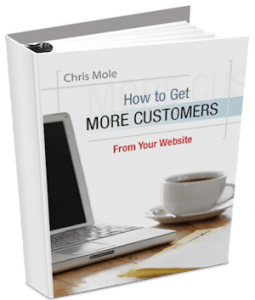 When you pro­mote a product or service in the context of your newsletter, you’ll get sales at a very low cost, gradually build a loyal customer base, and turn your email newsletter into a profit centre! Dr Ralph Wilson, editor of Web Marketing Today, refers to the Law of Pull and Push in Internet marketing. It works like this: you pull people to your website with great content and some advertising and obtain permission to email them. Then you regularly push in­formation out to them via email. It’s a Law you can’t afford to ignore. If you haven’t developed an effective email newsletter, you’re leaving a considerable amount of money on the table in your online marketing. One of the classics of email marketing is Seth Godin’s Per­mission Marketing. It was written in 1999 but is still abso­lutely relevant today. Godin’s thesis is that people are more open to your mar­keting message if you ask them for permission first, rather than just send it out unsolicited, which basically amounts to spam. These days, no reputable email marketing service will ac­cept you as a client unless they are convinced that you are following good permission marketing practices. If you spam using their service, they’ll terminate your account pretty smartly. You might think this follow up process is going to be complicated and time-consuming. But it’s not, when you use autoresponders to deliver your messages automatically. A visitor comes to your website and has an interest or need for what you are selling. They enter their name and email into a form on your web page, to receive some free information from you. You might offer a free report, or a newsletter, or some other free offer that is appropriate for your particular business. In other words, you must offer a reason why people should be on your mailing list. The form on your website automatically submits the visitor’s name and email to your database. Over a period of days and weeks the follow up messages that you have pre-written are automatically delivered to each subscriber. It’s all done on autopilot! Number one is Aweber – www.aweber.com. In terms of getting emails to your subscrib­ers’ inboxes (rather than the junk mail folder) Aweber has an impressive track record. It also has great tracking features, and is very user-friendly. There are several other good autoresponder and email marketing services.